Ridgefield in the 20th Century was home to several novitiates, schools operated by religious congregations that trained future priests, sisters or brothers. The largest and longest-lived novitiate belonged to the Congregation of the Holy Ghost, then commonly called the Holy Ghost Fathers. Now officially known as the Congregation of the Holy Spirit, or the Spiritans, the missionary order bought the former Cheesman estate on Prospect Ridge and trained novices there from 1922 to 1971. Not surprisingly, the operation of a novitiate in the center of town attracted a number of young Ridgefield Catholic men. One of them was Francis McGlynn, who wanted to become a missionary in Africa. He wound up, however, spending most of his career within 20 miles of his birthplace, not as a parish priest but as a leader and scholar of national reputation, a theologian and professor of theology who taught decades of future missionaries. Francis Hennelly McGlynn was born in Ridgefield in 1897, attended grammar schools here and graduated from Danbury High School (in the days before Ridgefield had its own high school). 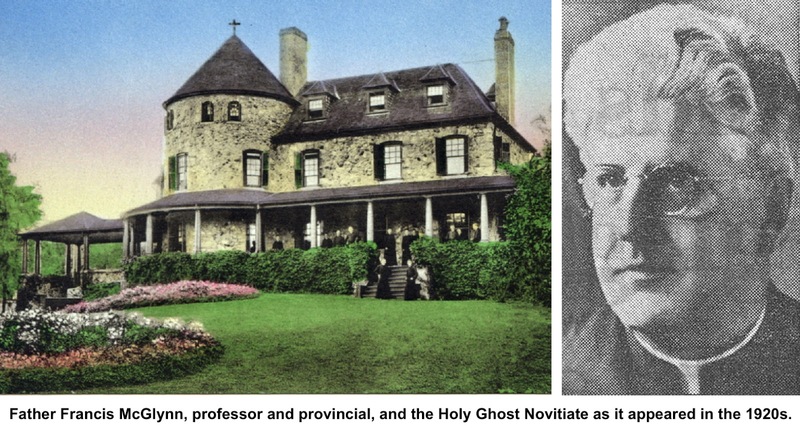 In 1918, he entered the Holy Ghost Novitiate on Prospect Ridge, studied at the congregation’s major seminary at Ferndale in Norwalk and at St. Thomas Seminary in Hartford. He was ordained in 1924 and celebrated his first mass at his old parish church of St. Mary. Within three years, he was named master of novices at Prospect Ridge and a professor of sacred scriptures. Clearly seen as a rising talent in the order, McGlynn in 1929 was sent to the Gregorian University at Rome to earn a doctorate of sacred theology. For the next 20 years he was a professor of moral theology at Ferndale, serving also a head of a retreat program for lay Catholics. Not only his scholarship but his leadership skills were recognized by the congregation, which named him superior — the head — of the seminary in 1947 and two years later, the provincial — the head — of the congregation’s entire United States province. During his eight years as provincial, he led more than 100 of the congregation’s operations in the United States, Puerto Rico, and East Africa from the headquarters in Washington, D.C. But it was teaching that Father McGlynn liked best and after his term in Washington ended, he returned to Ferndale, where he taught and worked on retreats. He died in 1965 at the age of 68 and is buried in the cemetery at Ferndale. The Holy Ghost Novitiate, purchased by the town in 1971, became the Board of Education offices until the late 1980s, and was converted to the town’s congregate housing for the elderly, which opened in 1991. Ferndale was sold in 1979 and is now a 66-acre hotel and conference center called Dolce. Incidentally, although it has closed and consolidated many of its past facilities, the congregation still operates Duquesne University in Pittsburgh, considered one of the nation’s top Catholic colleges.